A new bike path is now bringing bikes and other human-powered transit from the intersection of Rt. 50 and N. Pershing Dr. to the intersection of Queen St. and Arlington Blvd. in Rosslyn. Now you can take N. Pershing Dr. to the Henry Gate of Joint Base Myer-Henderson Hall, and then zip down into Rosslyn to enjoy events such as the Rosslyn Jazz Festival, art exhibits at Artisphere, and Rosslyn's unique Potomac-shore eateries such as Heavy Seas Alehouse and the Quarterdeck. The path currently has a fair amount of debris on it, including some small rocks. So use some caution. The exit into Rosslyn is also currently a bit bumpy. But a few bumps are nothing comparing to the thrill and joy of getting into Rosslyn. 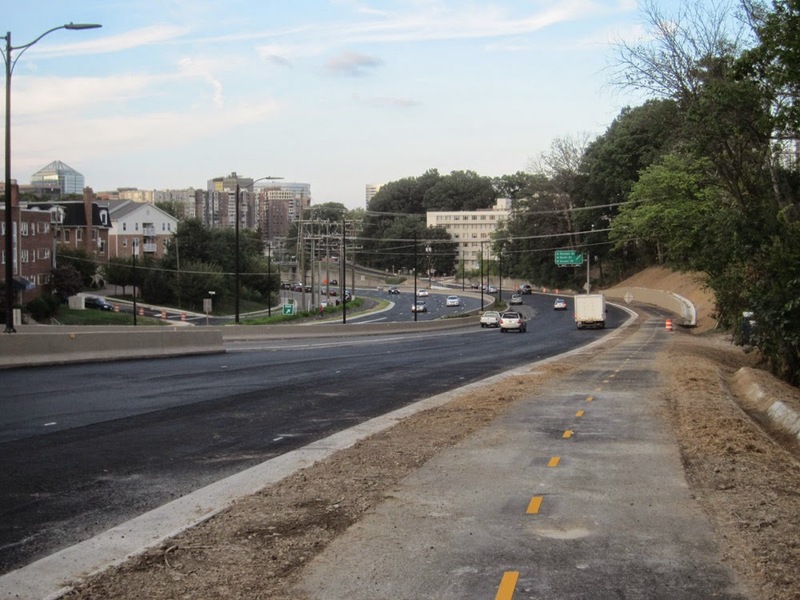 Take Fort Myer drive toward Arlington Cemetery; then turn left and follow along outer wall of the Cemetery... you'll connect onto a bike trail that takes you to Memorial Drive/Bridge.